Home › Food & Health › The Million-Dollar Question: What Do I Pack For Lunch? As the New Year begins, and children are now back in school, chances are you are struggling to think of what to pack for their lunch daily. It can be challenging to plan and prepare packed lunches as there is so much to consider, on top of your child’s likes and dislikes. Having the right meal is important for them so they have the energy to get through the day at school, and are able to focus. Find the right balance: Lunch has to be delicious, appealing to look at, satisfying and nutritious. Some important things to consider when planning packed lunch. Is your child is coming home at 3pm, or will he/she stay on at school for activities? If your child is participating in an after-school sport, there is a need for larger meal portions at lunchtime, or a small snack before the afternoon activity starts. Most of us have limited time in the mornings, as we are busy getting organized for the day. In this case, do prepare most of the lunch the night before, and leave the mornings to assemble and pack. Ideally, you could use leftovers from dinner as packed lunch. If your child is going to have lunch in the classroom, pack food such that there is no spillage, and it can be had without making a mess. If it will be in the cafeteria, where your child has access to space and cutlery, you can afford to be less careful. Also, if lunch will be a short duration, my experience is that my boys would rather be playing than eating, so I would pack something that can be eaten quickly. The right containers for packed lunch is important. You can either get one large container with different compartments, or use smaller containers to pack the different food items. Since mushy food isn’t appealing to children, do pack some foods separately. For example, if lunch is a wrap with vegetables, pack the vegetables separately as they can get soggy; your child can put it together at school (given consideration of time and space, of course!). Don’t forget, appearance of food is important to children! In warm climate, do pack a small ice pack if sending any dairy products, or anything that needs to be kept chilled. Cut the chicken breasts into strips. In a large bowl, beat the egg. Season the rice crumbs with salt and pepper in a large plate. Coat the chicken strip with the egg, then fully coat with the rice crumb. Heat about 2 tablespoons of olive oil in a frying pan and cook the chicken until brown, then turn it over to cook the other side. 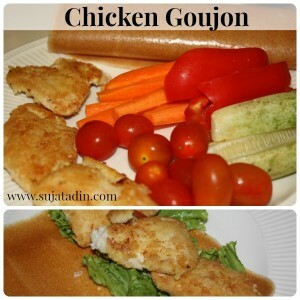 Serve the Chicken Goujon in pita or a wrap with salad, vegetables and a dip. To make the dressing, mix all the dressing ingredients. 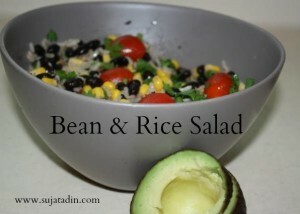 In a bowl, combine the brown rice, black beans, sweet corn and coriander. Mix in the dressing. Cut the avocado into cubes and pack separately. Add avocado to the salad before eating. To make the dressing, mix all the dressing ingredients. 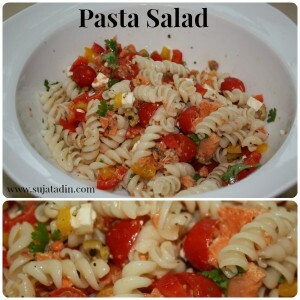 Combine all the salad ingredients in a large bowl and then mix in the dressing.